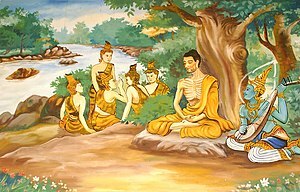 The founder of Buddhism, the religion practiced by millions in this world. Hindu religion considers him as an avatar of Vishnu. Born to Mahamaya the chief wife of King Suddhodhana of Sakyas. His mother had a dream in which she was carried by demigods to divine lake called Anavatapa in Himalayas. She was bathed by heavenly guardians. A great white elephant holding a lotus in his trunk came and entered her side. The dream was interpreted by king’s astrologers that a child would be born to her who shall either become a great emperor or a great teacher. Other interpreted the dream that the boy will see four sad events and decide to renunciate the world’s wealth and luxuries and riches. He was born as Siddhartha and Gautam was his Gotra. When he was born he immediately stood up and walked 5 steps and declared that this is his last birth. King was worried and tried every means to keep the boy away from all the events that can pain the boy and make him take up the path of renunciation. He married his cousin Yashodhara in a contest showing great skills and strength. As the destiny would have it, he happened to see the four events predicted by the astrologer. First was when he saw an aged man in last stages of infirmity and decrepitude- actually the God himself in the disguise. Siddhartha asked his charioteer Channa who was this repulsive man. Channa explained that everyone who is born has to pass to this state. Then he saw very sick man, then a dead man which was the last straw to break his resolve and last one was a ascetic in red robes with peaceful face. He returned to his palace and was in great pains. Even the news of the birth of his son Rahul did not bring any peace to his mind. That night he left his home with Channa and his dear horse Kanthaka and on reaching the forest cut off his flowing hair and removed his jewelery and robes and gave it to Channa to give it all to his father. The horse died instantly on parting with his master. Then for years he wandered here and there. He practiced great penances and tortured his body and was reduced to a skeleton. He realized that this is not leading him anywhere. He began begging for food and regained some strength. 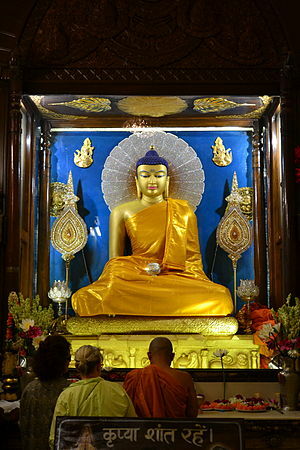 He sat under a Bodhi tree in Bodh Gaya and a village girl Sujata gave him rice boiled in the milk. He partook them and bathed and for next 49 days sat in meditation and at the end truth was revealed to him and he became Buddha. After initial reluctance he started spreading his peace message and made so many people his disciples and many Kings who could not appease the Brahmins as they did not belong to warrior caste patronized Buddha. He toured all the North India from one end to another. He also converted his father, son Rahul to Buddhism and allowed his mother and other women to become Buddhist nuns. When his end was near, he knew it and told his followers not to continue with the process of new successor. As was his nature, he would beg one house and whatever they gave him never refused. He was given contaminated pork meat by Chunda the smith. He ate it and was attacked by dysentery. He moved to Kusinagara and left this world there. Next Next post: Second Birth! !